Made2Matter are totally committed to protecting the privacy of all our website visitors and customers, that is why we will never disclose any information we collect about our customers to any third party except where it is necessary to provide or fulfill our service to you. We will not rent or sell your name, address, credit card information, email address to any third party. 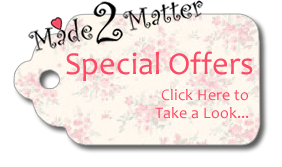 Made2Matter will not in any way contact you without your authorisation unless it is to fulfil our service to you.